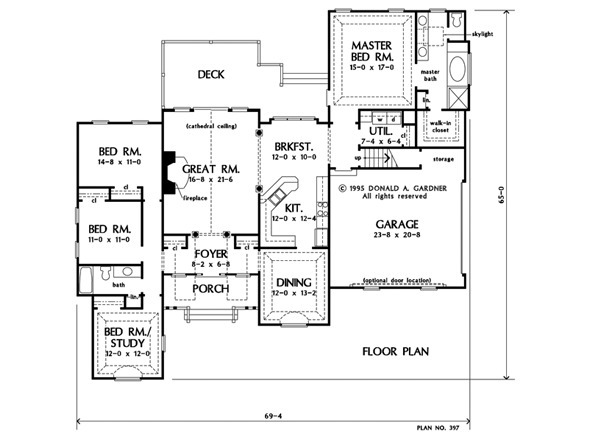 With its popular split bedroom plan and large, open common areas, this is a home with a layout and style for today's living. The country porch invites you into a foyer drenched with sunlight from dormers above, while columns punctuate the entrance to the great room and kitchen/breakfast area with box bay. Secluded in the back of the house is the master suite highlighted by a tray ceiling, rear deck access, and a bright bath with garden tub and double bowl vanity. Three additional bedrooms are located on the opposite side of the house and share a full bath with linen closet. A skylit bonus room provides flexibility and opportunity for growth. 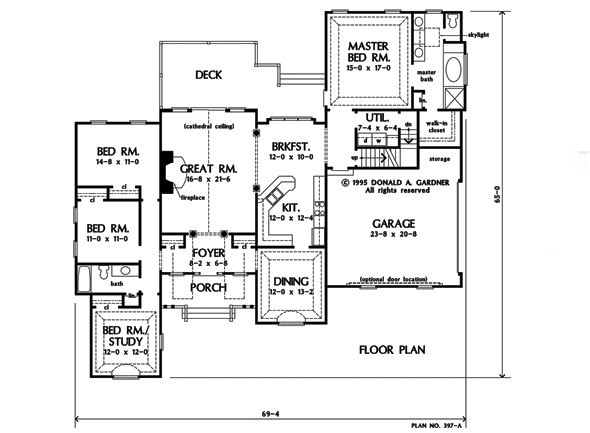 1st Floor: 2225 Sq. Ft. 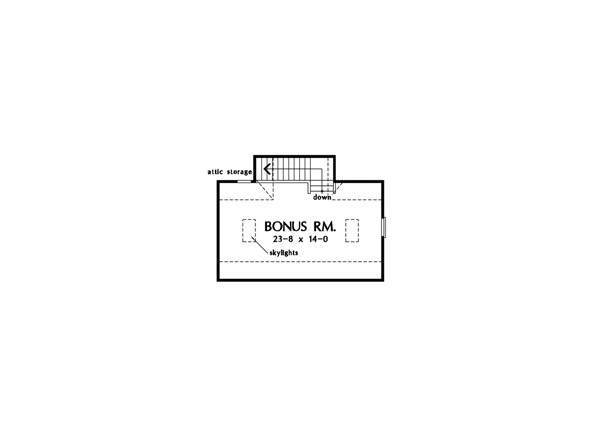 Bonus Room: 401 Sq. Ft.
House Dimensions: 69' 4" x 65' 0"
Great Room: 16' 8" x 21' 6"
Master Bedroom: 15' 0" x 17' 0"
Porch - Front : 16' 8" x 6' 0" x 0' 0"
Deck / Patio : 17' 4" x 12' 0" x 0' 0"
Storage (Other) : 6' 8" x 3' 8" x 0' 0"
Utility Room : 7' 4" x 6' 4" x 8' 0"
Bonus Room (Vaulted): 23' 8" x 14' 0" x 9' 0"
Garage : 23' 8" x 20' 8" x 0' 0"
Garage Storage : 7' 4" x 3' 4" x 0' 0"
Master Bedroom (Tray): 15' 0" x 17' 0" x 9' 6"
Bedroom / Study (Tray): 12' 0" x 12' 0" x 9' 6"
Bedroom #2 : 14' 8" x 11' 0" x 8' 0"
Bedroom #3 : 11' 0" x 11' 0" x 8' 0"
Foyer (Vaulted): 8' 2" x 6' 8" x 18' 6"
Dining Room (Tray): 12' 0" x 13' 2" x 9' 6"
Great Room (Cathedral): 16' 8" x 21' 6" x 16' 9"
Kitchen : 12' 0" x 12' 4" x 8' 0"
Breakfast Room : 12' 0" x 10' 0" x 8' 0"